I occasionally enjoy sketching from my laser disc collection. I prefer it to DVD because it has excellent step forward and reverse with the toggle knob on the remote. My DVD player has okay frame forward but poor frame reverse, so it's difficult hitting the perfect frames. This is the first time I've sketched Mr B. I fell in love with him as the character Marty, in the movie of the same name, when I saw it on TV in college. When he says, "We ain't such dogs as we thinks we is", I wanted to shout at him, "Shut up! You're beautiful!" I thought is was ridiculous miscasting, like when Michelle Pfeiffer was cast as the homely waitress in "Frankie and Johnny". 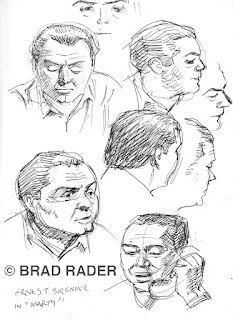 I have been assured that I am incorrect, that Ernest Borgnine IS homely. Interestingly, "Marty" (1955) was released 2 years after "From Here to Eternity" (1953). I saw the latter movie for the first time last summer. I was struck how he actually WAS ugly in that movie. It wasn't makeup; it was the way he spoke and moved. It was at this point that I became impressed with him as an actor.